SIGN UP TODAY!! LATE FEE AFTER NOV 17!! Go to LSSE.org to register for a division or call the LSSE Office at 413-259-3144TODAY! 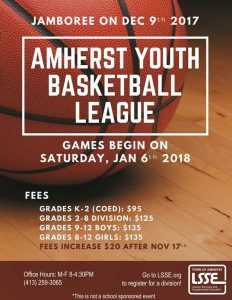 For more information about the leag ue, email Chris Johnson at JohnsonC@amherstma.gov.